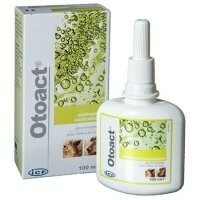 Otoact Ear Cleaner Solution 100ml is a gentle ear cleaner for dogs and cats that have a heavy wax build up. In cases where there is a high production of cerumen, Otoact gently and effectively dissolves excess wax and allows the owner to maintain good ear hygiene at home. Squalene - Has very high ceruminolytic properties and is not ototoxic. Salicylic Acid - Has keratolytic properties and acts by selectively breaking the keratinous protein chains present in the outer skin layers. It is well tolerated by the underlying cells and assists where there is hyper-reactivity of the skin. Camomile - Soothing and has a softening effect. Tannic Acid - Has lenitive and astringent properties on the skin. Instill Otoact into the ear canal and massage for a few seconds. Wipe off the excess with a piece of gauze or cotton wool wrapped around a finger. Repeat the treatment 1-2 times a week.